December 2, 1980. The segment from a fork of the headwaters in T12N, R10E, Kateel River meridian, to the confluence of the Kugarak River within the Selawik National Wildlife Refuge. Wild — 160.0 miles; Total — 160.0 miles. 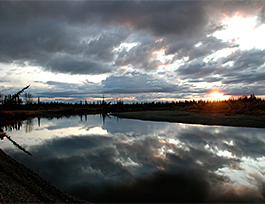 Lying entirely within the Selawik National Wildlife Refuge, this river is known for its fishing and variety of wildlife. The Selawik Valley is an important waterfowl nesting area and seasonally supports much of the Western Arctic Caribou Herd, which numbers over 500,000.